Rap festival Paid Dues (which is co-presented by Murs) started in LA over a decade ago, then became a touring festival, and then went on hiatus after the 2013 edition. It’s finally returning this year, happening just in LA like the first year, and the lineup is looking pretty stacked. 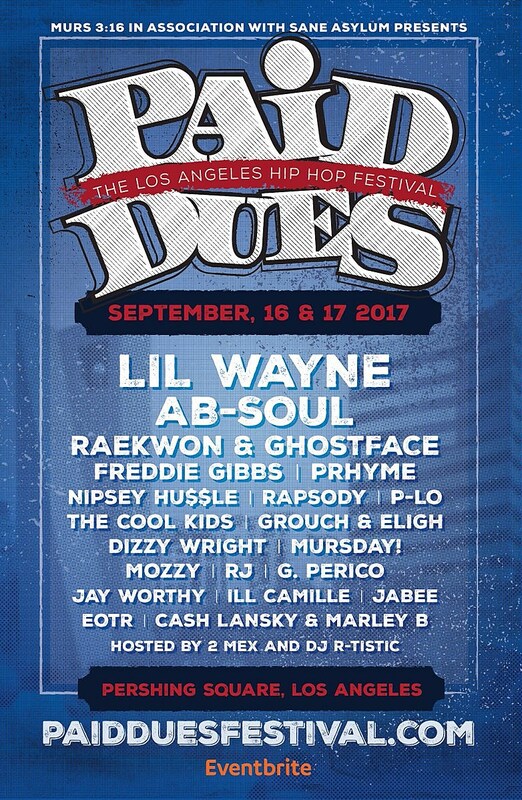 Paid Dues 2017 takes place September 16 & 17 in Pershing Square with Lil Wayne, Ab-Soul, Raekwon & Ghostface, Freddie Gibbs, PRhyme (aka Royce da 5’9″ & DJ Premier), Nipsey Hu$$le, Rapsody, P-Lo, The Cool Kids, Grouch & Eligh, Dizzy Wright, Mursday!, and more. The LA fest is also a good time to catch rising West Coast rappers like G Perico (who plays NYC tonight, 7/17)), Mozzy, and YG associate RJ, whose 2017 LPs have all been picking up buzz lately. Tickets for the fest are on sale now. Full lineup below.